Title Insurance Broward County: Why Title Partners of South Florida? 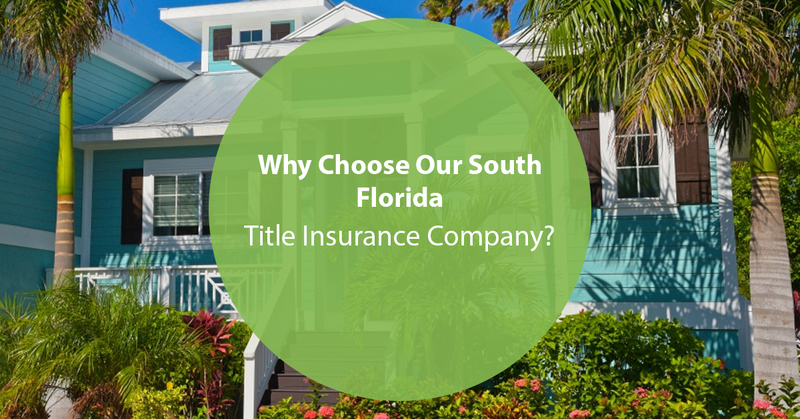 Home • Title Insights • Why Choose Our South Florida Title Insurance Company? If you’re thinking about buying a new home or piece of property, you’ve probably heard the following statement multiple times: “This will be the biggest and most important purchase of your life.” We’re not trying to downplay the potential of your future investments, but as a title insurance company serving multiple counties in South Florida, we’re inclined to agree with that statement. After all, what typical purchases in life are worth more than buying a home? Given that this is such a major purchase, you’ll need to back up said purchase with a number of insurance policies. To avoid any potential headaches and legal disputes down the road, you’ll want to make sure that you’re buying a home with a clear title. You’ll also want to lock down on a fitting title insurance policy for your home to prevent anything bad from happening to your home’s title. No matter what part of the title insurance process you need assistance with, Title Partners of South Florida is here to help. We provide our clients with comprehensive title insurance services from the moment you request a free, no-obligation quote to the moment you’re handed the keys to your new home. Our goal is to be clear, concise, professional, and friendly, ultimately resulting in a memorable and engaging closing experience. Of course, we acknowledge the fact that we’re hardly the only title insurance company in South Florida to choose from. Read on below for a few great reasons why you should choose us for a smooth, worry-free title clearing and closing experience. It’s true — our team is happy to speak with you anytime from Monday-Friday, 9am-6pm. If you contact us after hours, we’ll do our absolute best to get back to you as soon as we can. Best of all, when you call Title Partners Of South Florida, you’re going to speak with a real human, not a robot or an answering machine. Our goal is to provide a personalized closing experience for our clients through our title insurance services, and we strongly believe that genuine human contact is an essential part of the process. Quite literally, people’s experiences with our South Florida title insurance company really do speak for themselves. With a perfect 5-star average on Google based on 217 reviews and counting (seriously! ), we’re proud of the reputation that we’ve established. Our Top Rated Local® profile also shows that we have excellent reviews on Facebook and Yelp. From our extensive Title Q&A page to our title insurance blog and homebuyer’s closing guide, we make sure that you have credible research materials available at any time. Purchasing a home is stressful and time-intensive — why make it more difficult by working with the wrong title insurance provider? Whether you’re in Broward, Miami-Dade, Palm Beach, or other counties in South Florida, contact our team today!